Each pair of Basketball Wives Crystal Bamboo Crystal Hoop Earrings are made of high quality Acrylic Crystal,the fascinating colors and the trendy styles are certainly the hottest bling jewelry earrings this winter. 1. Feature: Each pair of Basketball Wives Purple Crystal Bamboo Hoop Earrings are made of high quality Acrylic Crystal,they have fascinating colors and the lovely teardrop design,the eye-catching diamond style,and also the versatile round design.are"hot in the streets',at the time. 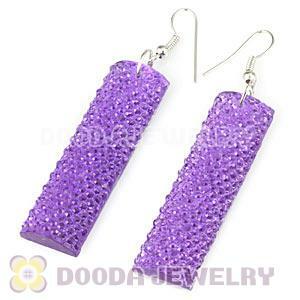 Basketball Wives bamboo inspired crystal earrings were also referred to as door knocker earrings, due to their size. They were are made of high quality Acrylic Crystal,the fascinating colors and the trendy styles are certainly the hottest bling jewelry earrings this winter.They came in many different shapes such as the lovely teardrop design,the eye-catching diamond style,and also the versatile round design.These beautiful design, oversize hoop earrings have hoops for pierced ears. What gorgeous sparkling and sophistication! You will wear these with every color in your wardrobe and they will be stunners with any color you like.